Netherlands defender Virgil van Dijk displayed his compassionate side following his last-gasp equaliser against Germany on Monday. 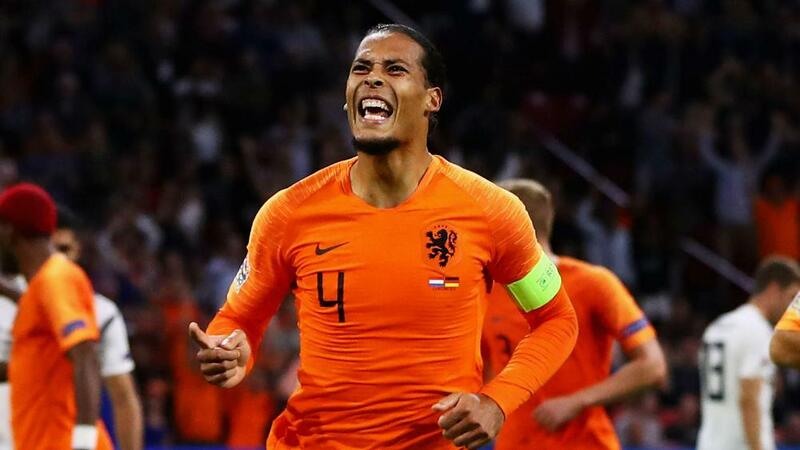 Van Dijk's late volley salvaged a dramatic 2-2 draw for the Dutch in Gelsenkirchen, propelling them into the Nations League Finals in Portugal next summer and completing a miserable campaign for Joachim Low's hosts, whose relegation to League B had already been confirmed. The final whistle prompted enthusiastic celebrations for the Netherlands players but Van Dijk instead sought out referee Ovidiu Hategan - the Romanian official who was in tears following the recent passing of his mother. Van Dijk told Voetbal International: "The man broke down with tears in his eyes because he had just lost his mother. "I wished him strength and said he had refereed the game well. It's a small thing but maybe it will help him." Netherlands' qualification for the final four of the Nations League continues their resurgence under Ronald Koeman, although they were second best for long periods against a Germany team struggling for form. "We had a lot of the ball but were not able to put any pressure on them," the Liverpool centre-half added. "Germany are, of course, a good team, they played well between the lines and with strikers that had a lot of movement. "We had trouble with that, it is something we have to learn from."